If you can’t get to Customer Insights (either because you don’t have access to it at the moment or because you can’t log on from wherever you might be), well, don’t worry about: it’s possible to have Customer Insights come to you. (At least the data part of Customer Insights anyway.) 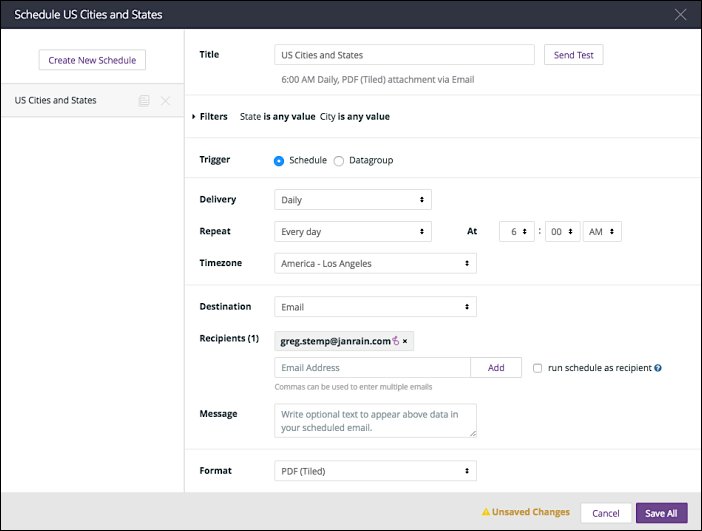 With Customer Insights, you can “schedule” any Dashboard or Look: that means that you can have the data (and, depending on your preference, the visualizations) emailed to you on a regular basis. For example, suppose you start work at 8:00 AM every morning. If you wanted to, you could schedule Look data to bel delivered each morning, Monday through Friday, at 7:55 AM. At 7:55 AM, Customer Insights will execute the Look query, package up the data according to your specifications, and then email that package to you. When you get to work, your report will be waiting in your Inbox. Click the Settings icon in a Look or Dashboard and then click Schedule. Click the Create Schedules link while viewing a Look. Click the settings icon for a Look or Dashboard in the Shared Space and then click Add Schedule. Click Send Test to immediately send a report to the currently-selected destination/recipients. Despite the name, this is an actual report using actual data: the test report uses the current dataset and is formatted using the options currently selected in the Schedule Geographic Locations dialog box. The primary difference between a test report and a “real” report is that the test report is sent on demand and is not scheduled. On week days only. Reports will not be sent on Saturdays or Sundays. On specific days of the week. You can specify any (or all) the days of the week. Time zone used to when executing queries and delivering data. For example, suppose you schedule delivery for 3:00 PM Eastern Standard Time. That means that users in the Pacific Time zone will get delivery at 12:00 PM. PDF (Tiled). The report is sent as an attached .PDF file that mimics the look of your Dashboard. PDF (Single Column). The report is sent as an attached .PDF file, with the visualizations arranged in a single column. Inline (Image Tiled). The report is sent as a single .PNG image that is effectively a screenshot of your Dashboard. The .PNG file appears in the body of the email. Inline (Image Single Column). The report is sent as a series of .PNG files, one for each visualization in the Dashboard. The .PNG files appear in the body of the email. CSV ZIP File. The report is sent as an attached .ZIP file. Inside the .ZIP file are a series of comma-separated values files, one for each visualization on the Dashboard. There are results. If the query returns at least one record, the report is sent. There are no results. If the query does not return any records, the report is sent. There are either results or no results. In other words, send the report regardless of what the query does or does not return. You also have the option of enabling the setting And results changed since last run. In that case, the report is only sent if it differs from the previous report. For example, suppose the query runs and it returns records A, B, and C. That information is sent out. Now suppose that, at the next scheduled run time, the query returns the identical 3 records: A, B, and C. Because nothing has changed, this “duplicate” report will not be sent if And results changed since last run is enabled.